Have you ever wondered what differentiates people who excel under pressure versus people who really crumble? Do you yourself struggle when there is an important task to be done? You feel your heart is pounding faster with every second. It’s that moment which feels like make or break. There’s lack of clarity in your thoughts, and you start doubting your own abilities to finish the task and ultimately begin to choke. Let me break it to you here: Pressure can be your worst nightmare. But did you know that it can also be the best thing which could ever happen to you? That is what this book is all about. No matter what you do, pressure situations will always keep following you. So why not use them to your advantage. This short read is here to prove that pressure, if viewed in a positive light can be something which allows you to thrive in your professional and personal life. What this book does is it helps you in developing that approach, that “Killer Instinct”, to look forward to those crunch times instead of being bogged down by them. Not only this, by the time you finish, you will be equipped with all the techniques which professionals from different fields use to thrive under pressure on a daily basis. So let your journey of thriving begin with this thought-provoking short read which will surely leave a lasting impact and completely change your view regarding pressure situations. Fajar Parvez wants to live in a world where people always strive to be their best self and remain optimistic even in the face of adversity. He is a young business graduate and has worked in the corporate environment for 2 years. He believes in the power of observation and so decided to encapsulate his experiences in his writing. Known for his honest reflection of the world around him, his motivation to write stems from his eagerness to help people overcome negativity and embrace positivity. 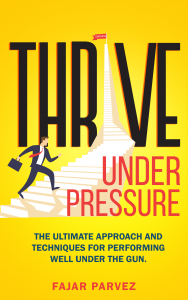 “Thrive Under Pressure” is his first book where he discusses how people can view pressure situations in a positive light to make things work for them.